Don’t hate me because I’m not a polymer clay person! Please! If I decided tomorrow that I wanted to make polymer clay beads, this would be the book I’d choose to take me on that journey. I almost fell victim to polymer clay fever as I read through this gorgeous book! 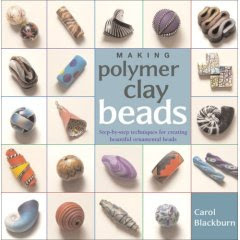 Carol Blackburn starts with the most basic of information that a polymer newbie would need to know, including information of the various brands and additional materials that you might want to use, tools that are nice to have, and basic techniques and baking instructions. She then leads you step by step through additional techniques that you will need for making all the blended colors, special shapes, canes, inlays, transfers, and other special effect beads you could want. Each technique is beautifully photographed. The second half of the book is devoted to faux techniques. This is where I almost lost my resolve and started making a list of colors to buy! 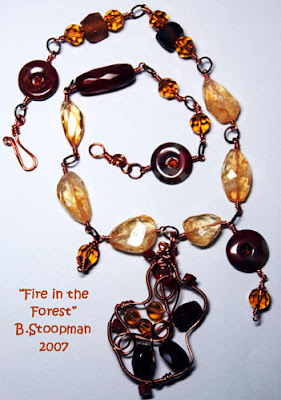 Carol shows you how to make wood, ivory, amber, leather, abolone, malachite, turquoise, and so so so much more. I was astounded. I wanted to play with clay. I wanted to buy Carol’s beads, but I’m not sure she sells them! 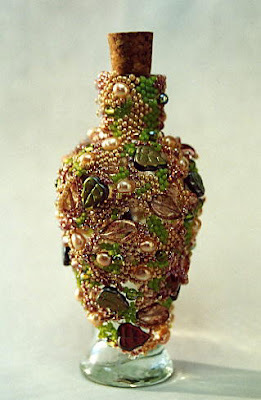 There are literally hundreds of books that you could buy on the art of working with seed beads, and most of them are good books, with something good to offer. And since I’m a book and magazine junkie, I own most of them. The ones that I don’t own, I’ve read, courtesy of the local library. It was hard, but I’ve whittled the list down to the very few books that I think are really the best of the best. The first two are excellent books that cover many techniques. The rest are specific to a particular stitch and go into an amazing amount of detail. The author emphasizes the how-to in this book. Every one of the more than 25 projects focuses on a specific tool or technique, complete with color graphs, a list of materials, size and measurements, a color photo, and diagrams. 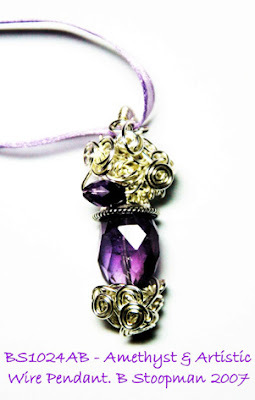 Beginners will find enough detailed instructions to get started while more advanced jewelry makers will find it provides new ideas for using stitches in different ways. 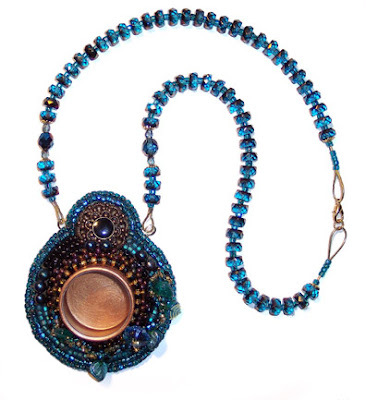 Focusing solely on brick stitch, this unique guide presents 10 exciting beading projects-from tassels to necklaces-along with detailed, illustrated instructions. 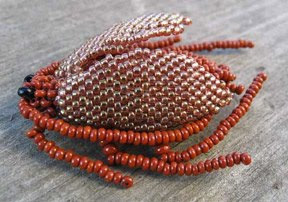 Here is everything the beader needs to know about using peyote stitch to create both flat and three-dimensional pieces. Thread, beads, graphing techniques, and five projects are thoroughly explained, and a brief history, with photographs. The herringbone stitch is a versatile and unique off-loom bead technique. 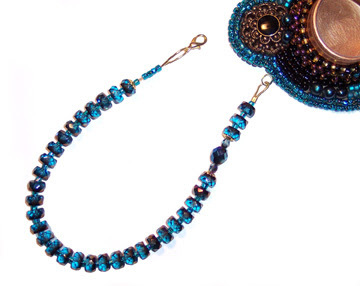 This guide offers a thorough historical and cultural background of the stitch, along with complete instructions for creating beautiful beaded projects. The right angle weave stitch is demystified in this beading handbook. All projects include easy-to-follow instructions and illustrations for both single- and two-needle techniques. 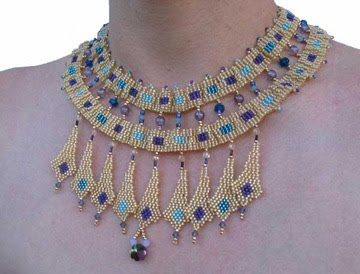 Emphasizing how beads add color, texture and beauty to a piece of work, they guide the reader through a variety of traditional and contemporary techniques, including bead weaving; sewing “trapped” beads; stitching beads onto mesh and canvas; and adding them to fringes, edges, cords, chains, and tassels. Beaders, quilters, and fiber artists will find this book invaluable for its solid technical information about how to apply beads to cloth, resulting in unique creations that will stand the test of time. 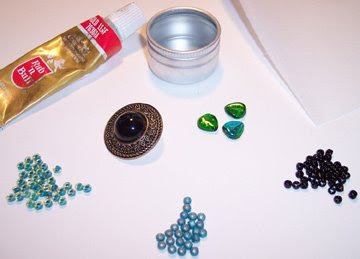 After finishing my monster embroidery project Andromeda’s Pearls, I thought that it might be a good idea to share a really basic tutorial on bead embroidery, a project that can be finished in a few days (or even possibly one long day). Treasure Chest is the name of this piece. 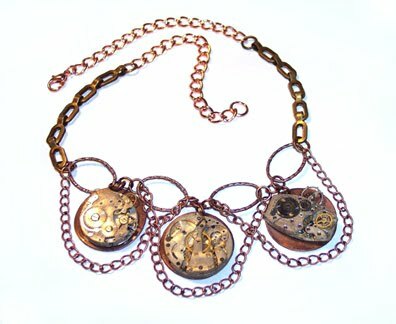 More and more often, modern jewelry is being influenced by techniques from other mixed media art forms. 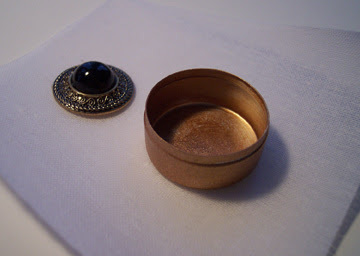 That is how Treasure Chest came to be: although I originally bought a set of watch-maker’s tins to use in some assemblage work and altered books, it occurred to me that a tin would also be a perfect little niche on a pin or pendant. Just the right size to hold a favorite token, the glass-topped tin can be sealed to make it permanent, or left loose to allow for an ever-changing display! 1. Use Rub and Buff on your tin if you wish to change its color. Do not apply the colorant to the back. 2. 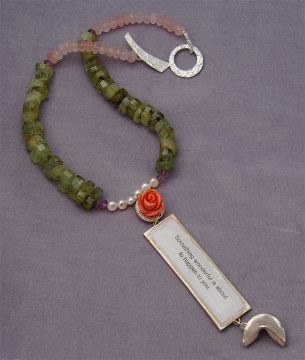 Choose the beads, cabochons, and charms that you wish to use in your pendant. 3. Cut out a piece of buckram, approx 4 x 4, and draw the shape of your completed pendant's border with a permanent marker if you want to. I usually do not do this as I like to see what shape the piece will take naturally, but many people feel more secure with a plan. 4. Arrange the large focal pieces, and glue down the ones that won't be stitched into place, including the tin, using E6000. 5. 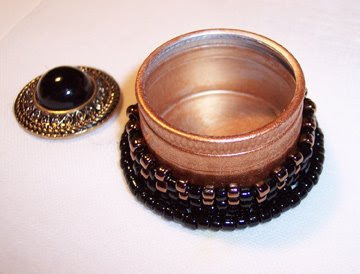 Create beaded bezels around your tin and cabochons. First, encircle the tin with a row of back stitching. Place 5 or 6 seed beads on your needle and stitch down through the buckram where the line of beads ends. 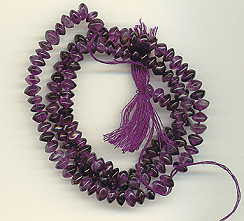 Come up between the 3rd and 4th beads, and restitch through the rest of the line. Add more and repeat all the way around. When the first row is finished, run the thread back through the entire circle, pull snug, and stitch back into the buckram to prepare for the next step. 6. Begin to weave upward with peyote stitch, continuing to encircle the tin for several rows. Take the thread through one bead in the bottom row, add a bead to the thread and skip the next bottom row bead, taking the thread through the following bead. Repeat all the way around. When the bezel is as tall as you want it, run your needle and thread back down to the bottom of the stack, following a thread path from row to row. 7. 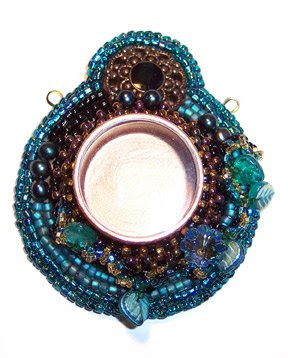 Continue beading with back stitch outward from these focal points using different styles of beads until you fill the buckram just to the inside of your border, if you drew one. 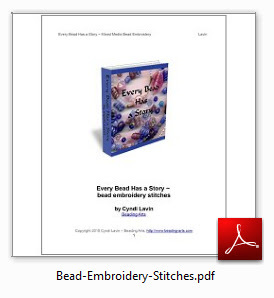 Use back stitching, small stacks of beads, and any other bead embroidery stitches you like. Use some higher dimensional stitches, especially close to the tin so that this taller piece will be more fully integrated into the design. 8. Back stitch a final row of 8/o seed beads completely around the border. 9. Run a thin bead of fabric glue just outside the last row of beads. Let it dry. 10. Clip the buckram close to the last row of beads, being careful not to cut any threads. 11. Determine the placement of your metal loops and stitch them into place on the back of the buckram, hanging over the edges. 12. Using just enough fabric glue to create a slight tack, attach the wrong side of the beaded buckram to the wrong side of the ultra-suede. The glue will only be holding them together while you do the final stitching. Don't use much or you'll stain the ultra-suede where it seeps through. Let it dry. Take a few small shallow stitches to anchor the thread between the two layers, close to the edge. Needle up to the top, exiting behind the border row of 8/0s. Pass the thread between the two closest beads in the border row, pick up one 8/0 bead, and needle up from the bottom through all layers of fabric, exiting again just behind the border row. Then pass the thread between the border beads again and down through the bead that was just added. 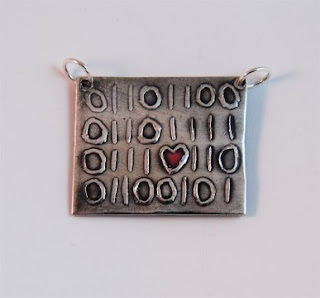 Pick up another 8/0 bead, needle up from the bottom, and repeat the sequence for the entire shape of the pendant. 1. Determine how long you want your straps to be, and cut two pieces of beading wire, each 5 to 6 inches longer than the intended finished length. I made each of mine about 10 inches long. 2. 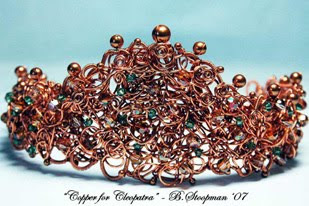 Slip a crimp tube and a short piece of bullion wire over one end of the first piece of beading wire. 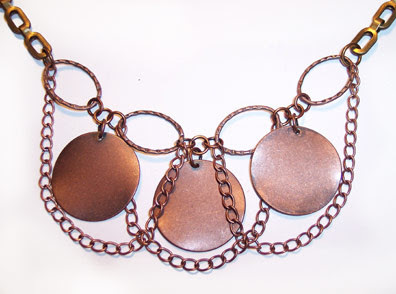 Pass the end through one of the metal loops on the pendant and back through the crimp. Tighten and flatten the crimp with your pliers. 3. 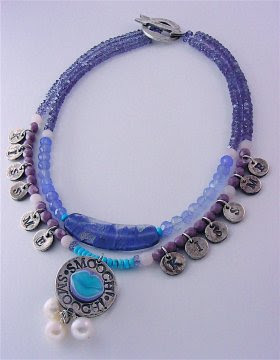 String your Czech glass beads in a pattern that pleases you, alternating with 8/0 seed beads. I strung about 9 inches of beads for my necklace. 4. 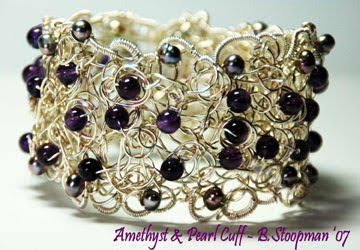 At the other end, string a crimp bead and another short length of bullion wire. 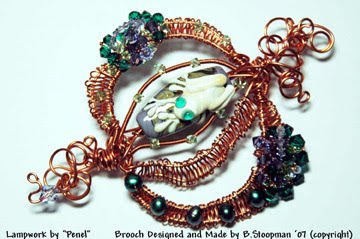 Pass the end of the wire through the lobster claw and back down through the crimp tube and several more beads. Pull snug and flatten the crimp. Clip the wire end close and push any raw edges into the next bead. 5. Repeat for the other side, taking that end through the jump ring. Dulcey, would you tell us how you describe your work? My creative process mostly begins with an idea of a shape. Sitting on my work table right now are some rose montees and a drawing of a Celtic knot-inspired border. I’d like to get the two to meet in a necklace; keeping the diagonal slant of the knot will require modification since I work with thread and not wire. A recent piece reveals the extent to which I will go: for a swap of small beaded hearts for Valentine’s Day, I started with a picture I found of Pakistani embroidery that I used for both motif inspiration and colors. Then I learned that the national language of Pakistan is Urdu, and how to draw “mohabbat” (love) in script. I made the arches of heart pointed, to reflect the arches often seen in architecture of the area. I am a web-surfing librarian in my day job — it helps. I usually don’t go quite this far! For a fun piece I entered in the 2005 Minnesota State Fair, I brought home the stick from a giant pickle-on-a-stick that I had eaten at the 2004 Fair, and then recreated a beaded pickle with right angle weave over a form on that stick. It greatly amused the judge, even though he thought it was a corndog totally covered in mustard. My beaded figure that I made for Interweave’s Beaded Figure was first inspired by a beautiful French bead that is a milky white, reminiscent of marble. Then I went to the Minneapolis Institute of the Arts to figure out stances for Ancient Roman statues. I decided one arm should be partial to reflect the damage often seen in these statues. Mostly, I work in small chunks of time towards any project, small or large. I keep lists and rough sketches, take pictures of all sorts of things for inspiration, and then try to assign myself working time. I have more things to do than can possibly be done, so I make lists for each month of 3 or so items related to my beadwork, whether it’s writing an article, planning a larger project, or actually doing the project. 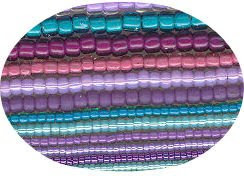 I try to give myself at least a few minutes of “bead appreciation” time daily, so that I can at least play with combinations of color even if I’m not picking up a needle. I have learned technique mostly from reading instructions in books and magazines. I have been fortunate to take two week-long Split Rock Arts programs through the University of Minnesota. The first was with Joyce Scott, and the second was with David Chatt. I learned so much from both of them, both are excellent and enjoyable teachers. Beyond learning about their techniques, sculptural peyote and right angle weave, respectively, I learned about the working life of an artist. How to present a piece for judging, for example. Or valuing a piece. Setting aside studio time to work. Things like that. I have a lot of thread. A LOT of thread. An embarrassing amount of thread! Seed beads are the mainstay of my work, so I have those too, of course. I’ve tried a variety of methods. That smooth, increasing, three-dimensional curve? I’ve given that one at least a dozen attempts, it’s now set aside until new method inspiration strikes. I tend to like to bead my own designs. Sometimes it’s relaxing and rejuvenating to bead someone else’s design, then I can just enjoy the process, and appreciate someone else’s hard work. Also, I’m an advocate for finding inspiration in other mediums — going to a museum, reading coffee table books, enjoying the local nature center. The best idea can’t be fully realized until your technique is immaculate. Good craftsmanship and finishing is essential. 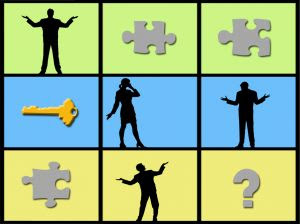 Ask for and accept constructive criticism. I am married with school-age children, so family is where I happily spend an important amount of my time. I also am a public librarian, with my hours averaging about half-time. I also read voraciously. Beyond family, beading, and reading, I like to cook a fairly wide variety of foods; I bake our bread. Family, food, beads, and books. Good stuff! Melissa, how do you describe your work? I like to think of my jewelry as being a little bit quirky, often reflecting my odd sense of humor and almost always reflecting my rather eclectic interests. In my personal life, I tend to be a bit quiet. In business (I am a lawyer by training, although I am not currently practicing), my demeanor has to be conservative and professional. 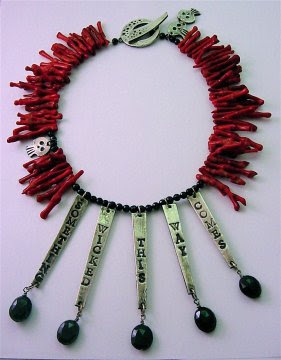 My jewelry provides a “voice” for other aspects of my personality that I might otherwise be too shy to articulate. My creative process is informed primarily by the fact that I am first and foremost a mother. 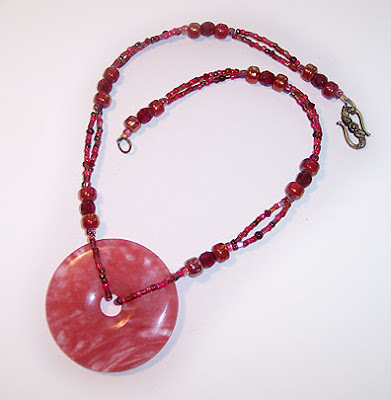 Before my son arrived, I spent fairly long hours in the office or on the road and the timing never seemed right to pursue any type of jewelry-making beyond really basic stringing project. Plus, at the time, I was leery of working with a lot of unfamiliar equipment. I was frightened of the torch. I was worried that I would burn down the house if I bought a kiln. It all seems a little funny in retrospect. 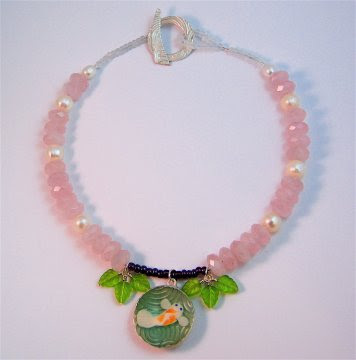 Staying at home with my son gave me the opportunity to try my hand at making beads and jewelry. Plus, although I really loved (and love) having the opportunity to watch my son grow up, I wanted to try something new, something that didn’t directly involve being a stay-at-home Mom. The time seemed right. To my surprise, I found that I loved it. 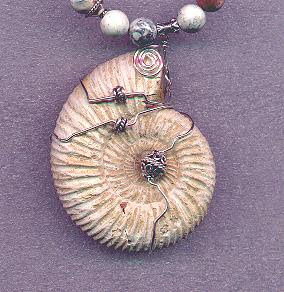 I started with lampworking and a few months later moved on to metal clay. I now work pretty much exclusively with metal clay. Nowadays, once I have an idea in mind, I sketch it out as soon as practicable. Ideally, I sketch in my notebook. However, really, I’ll use whatever comes to hand, including my son’s crayons and art table, if that is what is available to me. The next step for me is technical planning. I still consider myself a beginner in this medium, and it’s important for me to work out the best way to execute my concept based on the skills I have, before starting. Once this plan is in place, I’m ready to start working on the actual piece. I do not have a dedicated studio space. I keep all of my metal clay tools in project boxes which I haul out when I’m ready to use them. As a result, I work with the clay only after my son is safely tucked in bed. Practically speaking, this means that I can only devote a couple hours a day to my jewelry. I have no formal design or art training. 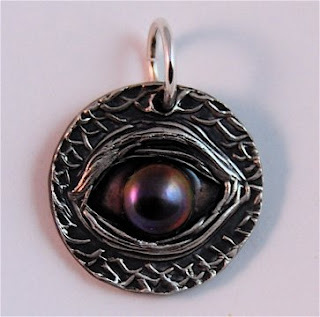 When I first became interested in working with metal clay, I purchased one of Tim McCreight’s PMC videos, Sherri Haab’s book, The Art of Metal Clay, and a starter kit. That’s it. I learned over time by trial and error. Frankly, my learning curve is still pretty steep. However, I continue to make progress, and that’s a great feeling. Having said that, I will admit that I’ve always loved working with my hands. I knit like a fiend. I took pottery lessons at a local studio for a couple years (only wheel-throwing, no hand-building, alas). These experiences may not have had a direct impact on my jewelry making, but I believe that being creative in one medium lends itself to being creative in other media. Well, I primarily use PMC3. 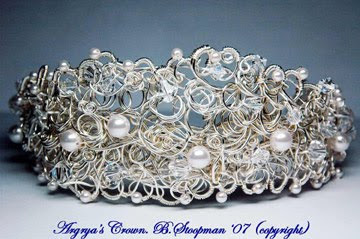 Without the metal clay, none of my work would be possible! Everyday people and items inspire me. I recently made a pendant based on a traffic light. That was fun. I am also an avid reader. I have an M.Phil. in English Renaissance literature and love the works of writers such as Shakespeare, Donne, Herbert and Herrick. These writers have inspired many of my pieces. At the same time, I also read genres such as science fiction and Japanese manga and find inspiration in this reading, as well. I’m fortunate in that I always seem to have multiple ideas running around my head at a time. My notebook is filled with initial concepts that I just haven’t had time flesh out yet. If I get frustrated while working on one piece, I put it aside for a while and start something fresh. I always find my next project inspiring, and that keeps my interest level high. After time, I’m able to re-visit my problem piece with a fresh eye and perspective, which usually helps. Well, I’m sure most people would find it completely cheeky for me to be offering any advice of this kind at all! I will say that I think it’s important to create your designs around what you love, rather than trying to follow what’s popular or someone else’s trend. My son! He’s an active toddler and getting faster on his feet every day. He seems to be artistically inclined, judging by the copious amount of crayon drawings we have in the house now. I’m looking forward to mother and son art classes with him in the future. A good introductory article by Jeremy Glatstein on the elements and principals of composition. An entire online design course by Charlotte Jirousek. Tips supplied by various artists.